We leave for Minneapolis in a week – next Tuesday. Some of us will be there Tuesday evening to be ready to start building the booth – Modaland – Wednesday morning. I’ll be there because I follow directions well – hey! no laughing allowed! Thank you for all the incredible support and participation in the Piece & Comfort challenge. As of Monday morning, almost 100,000 votes had been cast for the Viewer’s Choice. Voting is open through tomorrow – Wednesday – May 6th so if you haven’t voted, there’s still time. To see the quilts and vote – Piece & Comfort Challenge. A huge thank you also goes out to Stephanie and Tom Hove, Tammy Vonderschmitt and Angela Yosten. Each of them did an amazing job making the challenge happen. Market “stuff” is being delivered daily so it can be shipped – a couple different tote-bags, handouts for Schoolhouse, and the new Moda catalog – commonly referred to as the “playbook”. I think it’s called that because it’s full of cool fabric that we all way to play with. Work on the Spring Market catalog started the day after the pre-Market catalog was completed, though it probably started before that because like so many other things, the catalog isn’t the work of any one person. From the concept to the layout, the graphic work and the details, there are several people contributing to how the finished catalog looks. It was “completed” last week, sent to the printer, and a couple thousand copies were delivered this morning. And no, I can’t show you what’s inside the catalog… not just yet. It’s simple – the designers of these collections would not be happy if I showed you something before they’ve had the chance to do it first. You know how girls love their secrets… besides, we have to save something for Quilt Market. It’s only a week away… the time will fly by. Now where was I? The catalog. This was the pre-Market catalog – it came out last month… a few weeks ago. I love the cover on this one – it’s one of my favorite Moda catalogs ever. 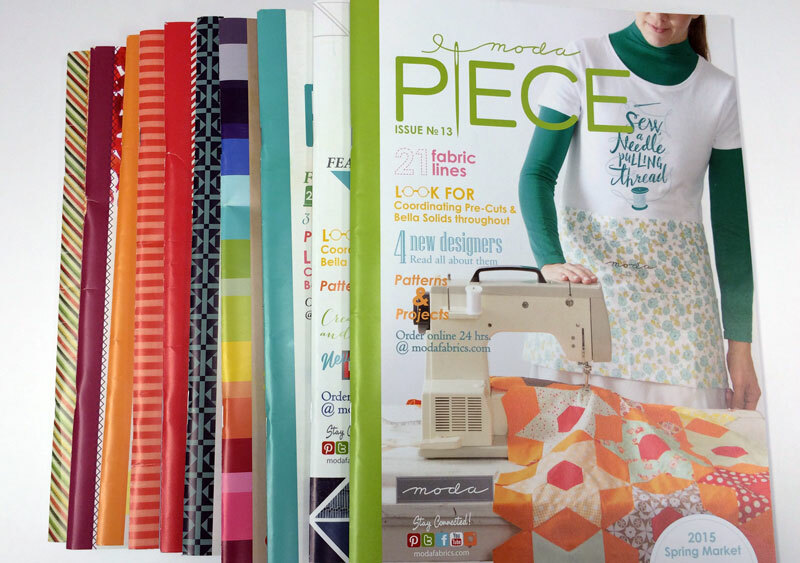 This has an amazing mix of a dozen different collections, the idea for it was Lissa’s – ModaLissa – and you should know that she mixes fabrics and collections like this in quilts too. From there, the work goes to Holly and Joy. Technically, they’re graphic designers, but that’s not the whole picture. They have amazing art, computer and design skills. In the years that she’s been with Moda, Holly has worked on at least 40 catalogs. (She’s the same Holly who does so much of the awesome work on the Moda Market booths, and I wish you could see some of the things she builds, creates and paints.) While Joy hasn’t done nearly as many catalogs, she did the gorgeous graphic design work on the Frivols tins, and some other really cool artwork for decor, tags, ads, etc. The layout for the catalog is determined, and the look it’s going to have. What’s the theme? The list of collections is compiled. For each collection, a designer bio or “blurb” is written, the new quilt images are collected – if there are any – and the list of fabrics in each collection are laid out by color. The SKUs – stock numbers – and color names are listed, and all the information about when the collection will ship, what pre-cuts will be offered, etc., are gathered. The fabric images are scans of the actual fabric, those are done by Eladia – another person in the office who is very techno-computer saavy. (Without Eladia’s help, I still wouldn’t know how to scan or copy anything on the huge super-copier.) The scans are calibrated and checked for size and color accuracy; what appears in the catalog must be as accurate a representation of the actual fabric as humanly, digitally possible – and really, it’s impressive how accurate it is. Everything is compiled on the computer in digital files – inDesign. The pages are printed out and the “book” is compiled in a binder to get a sense of the flow and look of it. And to make sure there isn’t anything missing – literally and figuratively. It might be just me but proofing pages is so much more easily done with real, actual pages. The paper kind. That’s it there next to the finished catalog. 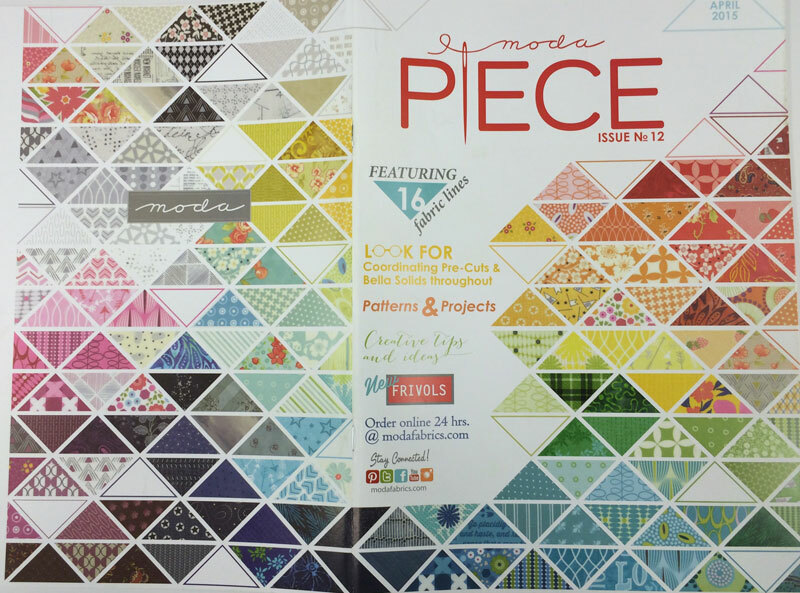 While this catalog won’t be available online until after Quilt Market starts, it will be found in the same place as all the digital catalogs. Go to the main United Notions website page and look on the bottom bar for Catalogs. Now I need to check out some catalogs of another kind… what am I going to wear next week? Somebody said something about a “color of the day”. Huh? Jeans. That’s a color, right? Color… oh no! Did I make a hair appointment this week? Never mind a Wonka-bar, I need a few oompa-loompas if I’m going to be ready by next week. Love, love, love reading everything you write about Carrie. Besides all your wonderful talents, you must have a background in writing. Continue to keep the humor in your writings, and I’ll be reading each and every one. Love hearing about anything that goes on at Moda! Gosh, I wish I could play along! Y’all have fun! oogle some of that new fabric for me! 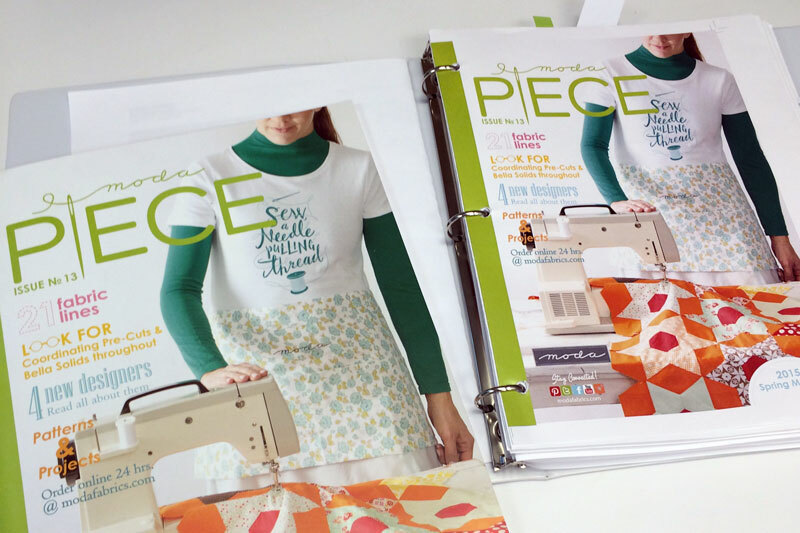 love the look of that catalog – like you I need pages to turn when proofing something. Have fun at market – looking forward to hearing all the news that comes from it. Your excitement is palpable – not that I would ever palpate you! Follow surely, copy definitely, but never palpate. This is the most excited I’ve ever been about a market I won’t ever get to attend. You really have brought the whole thing to life for us. Can’t wait to read the ModaRosie-ized version of the big event! Color coordinating designers? Now that sounds great;-) And don’t you worry Jeans is a color (at least to me) and it’s like Bella White – it goes with everything! Once the hair is done, it all falls into place! that’s my motto, any way!! This really is more exciting hearing it from your view, really enjoying it, and while your booth always had mega eye candy, won’t this be a far cry from your little fold up chair? Maybe we should get that chair bronzed for you!! LOL! You can just feel the drum beat getting faster and faster! So glad you are taking us all along too.